A healthy dinner at home goes for soft chappathis and a fingerlicking side dish. Most of our dinner will be either rotis or soups and salads. Its been quite a routine at home if i make soups or salads for a monday dinner obviously the next day will be definitely rotis.I love to make different subzis to enjoy along with those rotis. My lil one love potato and peas combination in curries, and this time i prepared that usual aloo matar bit differently by adding makhana aka fox nuts.Makhana or Puffed lotus seeds are known also as foxnuts, these are the seeds of the lotus flower. Makhana or puffed lotus seeds are very versatile and you can make many dishes out of it either as sweet or savory. 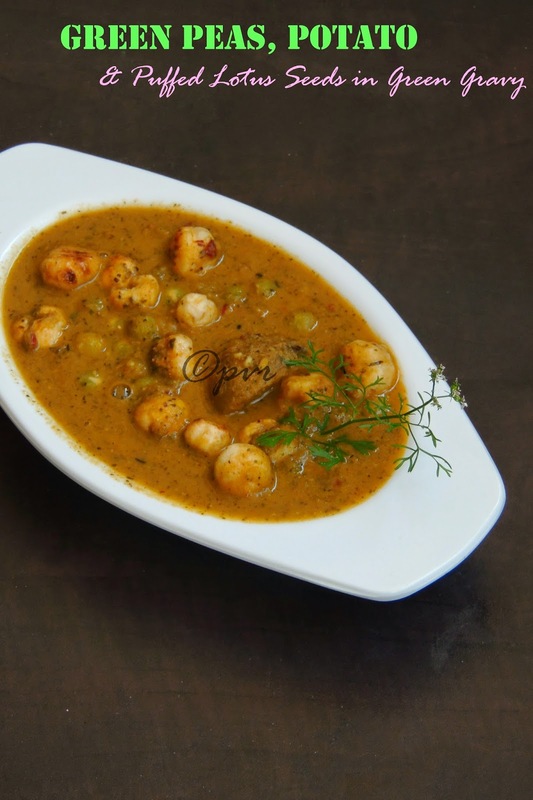 You can make many delicious, rich dishes with this foxnuts and they can be made with ease. This subzi is prepared with simple ingredients but with a green masala, which goes for both mint and coriander leaves. 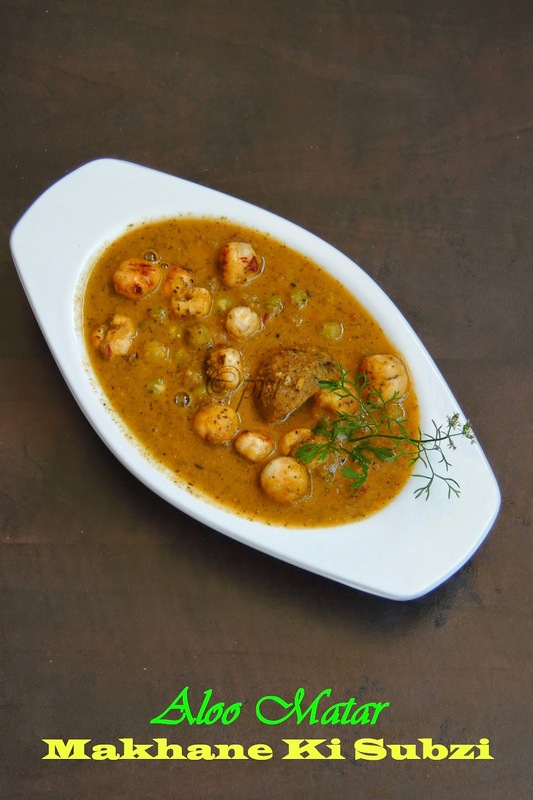 When served as side dish with rotis, this gravy tastes fabulous, its a prefect side dish for any type of parathas or rotis. Stuffed or not, parathas should be served with a side dish at home and we had this fingerlicking, aromatic gravy with chappathis for our dinner few days back. I used dried, soaked and pressure cooked green peas in this gravy. For the past two days, am posting recipes with green peas as am running this week's blogging marathon with Pick one ingredient and i picked Greenpeas from the list suggested by Valli. This gravy tastes equally delicious when served even along with hot piping rice.So do give a try to this different and definitely a delicious gravy in case if you have puffed lotus seeds at home.Sending this post to Ahlan Ramadan-The Healthy Way.Check out the Blogging Marathon page for the other Blogging Marathoners doing BM#41. Grind the ingredients given under the list to grind as a smooth and fine paste and keep aside. Heat oil in a pan, fry the lotus seeds for few minutes until they turns crispy,keep aside. In the same pan,heat oil and the butter, fry the shahjeera, bay leaves until they turns brown. Meanwhile grind the onions and tomatoes as bit coarse paste. Once the spices turns brown,add this onion-tomato grounded paste,ginger garlic paste,cook for few minutes until the raw smell goes away. Add the cubed potatoes, cook for few more minutes. Now add the cooked green peas to the cooking paste along with red chilly powder,garam masala powder, coriander powder and salt,cook for few more minutes. Now add the grounded paste to the pan and cook everything in simmer. Add enough water to adjust the thickness of the gravy , add now the already roasted lotus seeds and cook in simmer for few minutes. Put off the stove, add the chopped coriander leaves, give a stir. Priya, your subzi looks amazing..very nice combination of ingredients..
A lovely combination of flavours. I would love to dip flatbread into that gravy. I am yet to try/taste this puffed lotus seed, the curry sounds so flavorful and yummy...perfect combo for rotis! That is amazing combination....lovely ! Delicious combo..... never tried curry with lotus seeds, will try this ! Priya the sabzi looks yum. I love the makhana added. Now I need to make this asap. Looks so delicious and very healthy. I wish I get puffed lotus seeds here to try this recipe, very tempting. 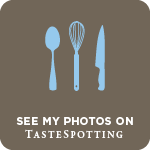 Lovely recipe and pictures..looks delicious! what an amazing combo! subzi looks yumm.. This is a hit combo ..and made regularly in our house though the gravy is different. The sabzi looks delicious. Yummy combo!! Perfect side dish to just about anything. Such a tempting curry, I have always wanted to try lotus seeds curry :) now I know which recipe to try. A good way to make use of the lotus seeds. Thanks for the idea. Love the recipe combination.